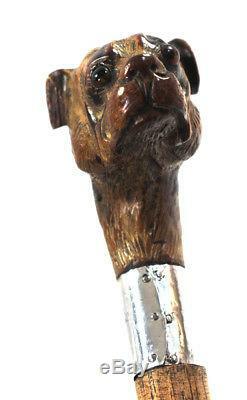 Lovely rustic wood carved study of a terrier with glass eyes. Not a manufactured study but a one off carving. Mounted on a slim line oak shaft with original base metal ferrule. Tested silver collar holding the worn stamp SIL and W? Good quality slim line cane with appropriate wear for age. Minor surface wood expansion crack to left ear lobe. Top Cane Diameter: 18 mm. 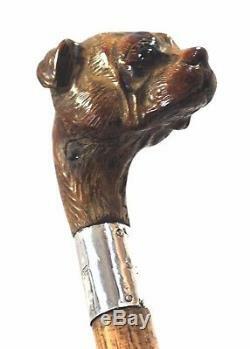 The item "Old Carved Dog Head Walk Stick" is in sale since Sunday, November 5, 2017. This item is in the category "Antiques\Woodenware\Walking Sticks/Canes".